Paris. She is unique. She is beautiful. She will wear you out! Have you been to Paris? What is your number one sight to see? There was never a time when I didn’t want to go to Paris. From music to movies, fashion to food, it’s always to be found in Paris. The first foreign language I took in school was French, and from that time on I was a Francophile. I loved everything French, and when I was old enough to get there on my own it was the very first place I went. I’m not alone. 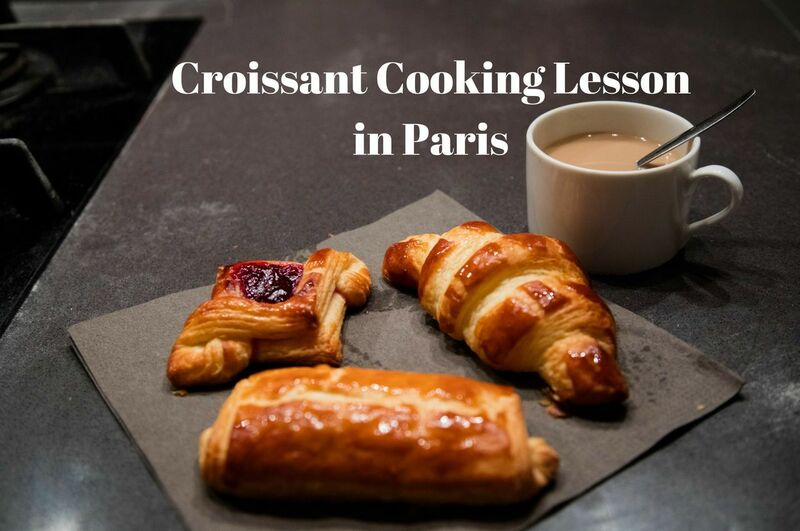 When I talk to fellow travelers, or even people who are just starting out to travel, France – well, Paris – is the first place so many want to go, and I strongly encourage everyone to do so. But be careful, Paris is a siren. She will get you in her grips; she will enchant you. You will have to go back again, and again, and again as I have done. Each time I find something new and exciting to try, to eat, to buy. Paris never gets old. To get you started, though, here are the most popular places in Paris. 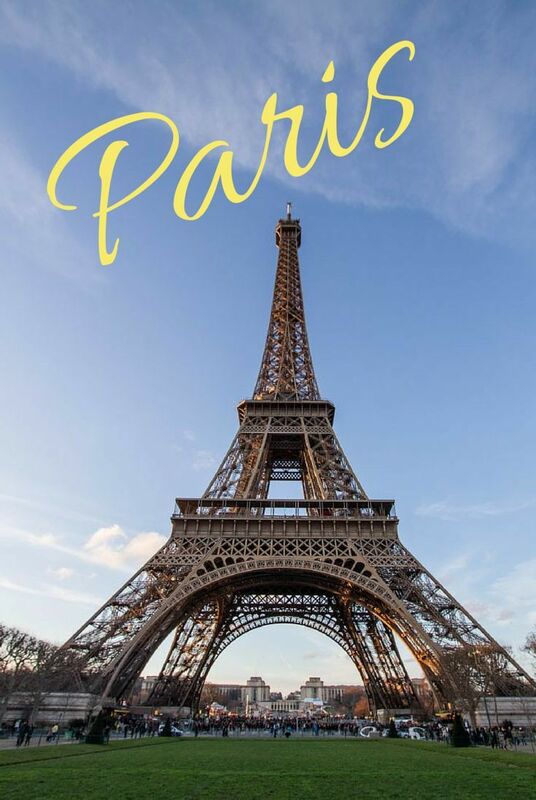 Paris is such an iconic city, it’s no wonder it’s on everyone’s list! To get you started, here is a list of the obligatory sights, the must-dos for the Paris first-timer. Of course there is much more to see and experience, but that’s for later posts. For now let’s concentrate on the must-visits. No one wants to go home from Paris and not have done all these. No one. Et voilà! Gustav Eiffel’s genius climbs high into the sky. Afraid of heights? Don’t look down! Built in 1889 for the World’s Fair, the Eiffel Tower hasn’t stopped drawing visitors since it opened. In fact, it is the most visited monument in the entire world. Now that is a superlative that just can’t be beat. 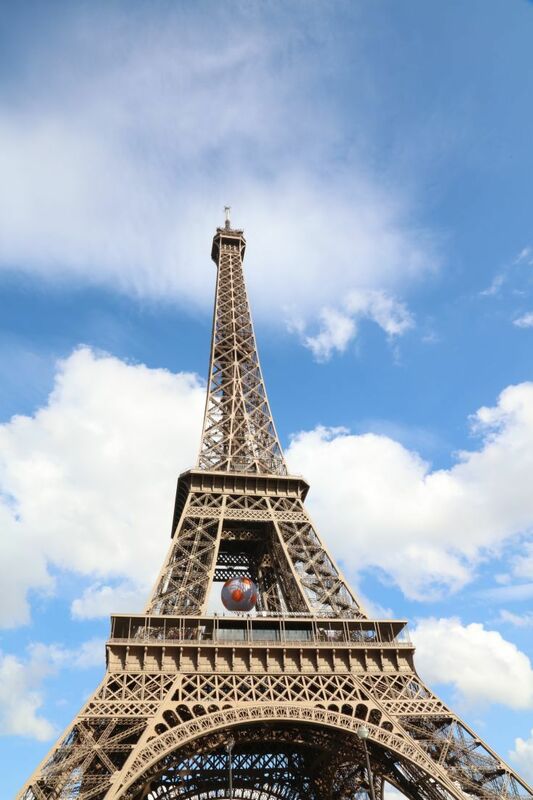 There are many ways to enjoy the tower, you can take a lift, walk up the stairs, book a table at one of the restaurants, have a champagne toast, visit Gustave Eiffel’s renovated office at the top, just go for the view, or use your imagination. Crowds are to be expected, so you will want to plan your visit here as carefully as possible. You can buy your tickets online, but make sure you are there at the designated time so you don’t lose your spot. For budget travelers, just seeing the Eiffel Tower may be enough. If this is the case, you can view it from the top of the Jardins de Trocadero (especially for the night illumination sparkles) or head down to the Champs de Mars and have a picnic on the green. You certainly cannot have a better view from either of these two spots. Eiffel Tower: Bus 42, 82, 87 (Champ de Mars, Champ de Mars- Suffren); Bus 42, 82 (Tour Eiffel); Bus 42, 69, 87 (Rapp – la Bourdonnais); Metro 8 (École Militaire) but it’s a bit of a walk or continue by bus. 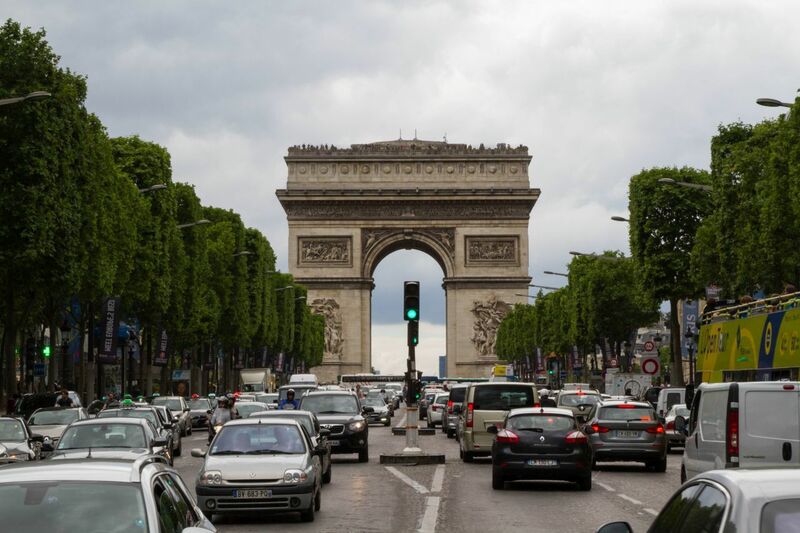 For the truly daring, rent a car or motorbike and drive around the Arc de Triomphe traffic circle, six unmarked lanes of pure frenzy and chaos! Another iconic stop on your Paris tour will be the Arc de Triomphe. Built in the early 19th century, it’s purpose is to honor those that have fought for France, but especially in the Napoleanic wars. However, one attraction is much newer, the Tomb of the Unknown Soldier and its flame. The friezes depict war scenes and if you climb to the top (no elevator) you will have amazing views of Paris in all directions, so try to go on a beautiful sunny day. The Arc is easy to get to from the Champs-Élysées or by bus or metro. The cost is a mere 8 Euros if you choose to climb the stairs to the top. 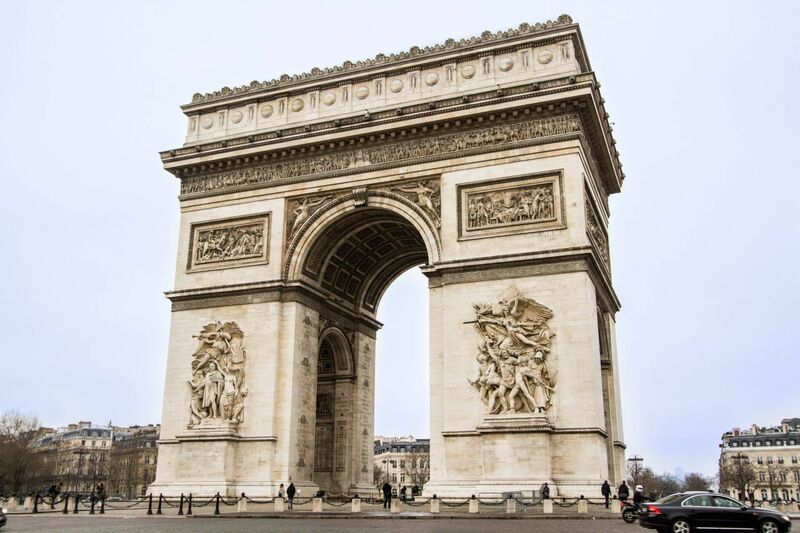 To arrive directly at the Arch de Triomphe: Metro 1, 2, 6 (Charles de Gaulle Étoile); Bus 22, 30, 52, 73, N11, N24, N53 (Charles de Gaulle – Étoile – Wagram, Friedland, or Champs-Elysees). Another option, combine a stroll up the Champs-Elysees with your visit to the Arc: Metro 1 or Bus 73, N11, N24 (George V). 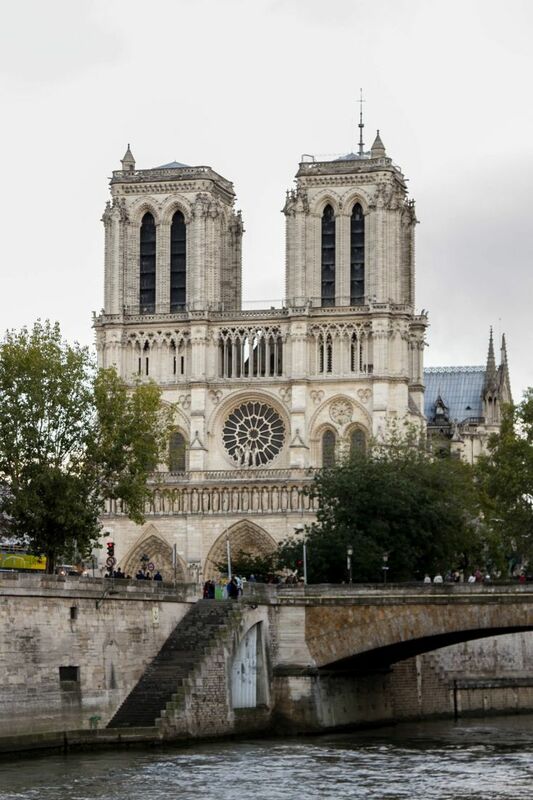 From the youngest child on up, most people have heard of the magnificent Notre Dame cathedral, whether because of Disney’s Hunchback of Notre Dame or the novel written by famous French author Victor Hugo; the site is on everyone’s list. There is plenty to see, here, so don’t let the crowds turn you back. Don’t miss the gargoyles, the rose stained-glass windows, the crypts, the organ, the bell towers, and the stunning view. Many important events have taken place at Notre Dame, but two of the most notable are that Napoleon declared himself Emperor here and Joan of Arc was beatified in 1909. It is free to enter the cathedral, but it will cost extra to climb the steps of the tower and to see the crypt. The cathedral opens at 8:00 AM and closes about 6:45 PM. In the summer, go very early and get in line if you want to climb the tower while it still is cool, and in the winter, go later in the day to get some sunset photos. If you are interested in the history or architecture, there are some guided tours that you can sign up for as well. Spinning on one foot atop the marker with your eyes closed will ensure the possible granting of one wish. 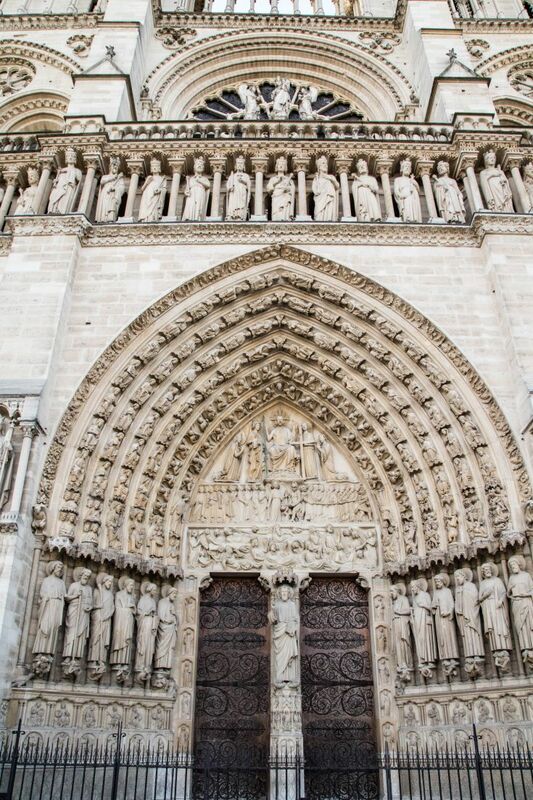 One bonus is that in front of Notre Dame, you will find a spot where many tourists are looking down and taking photos. 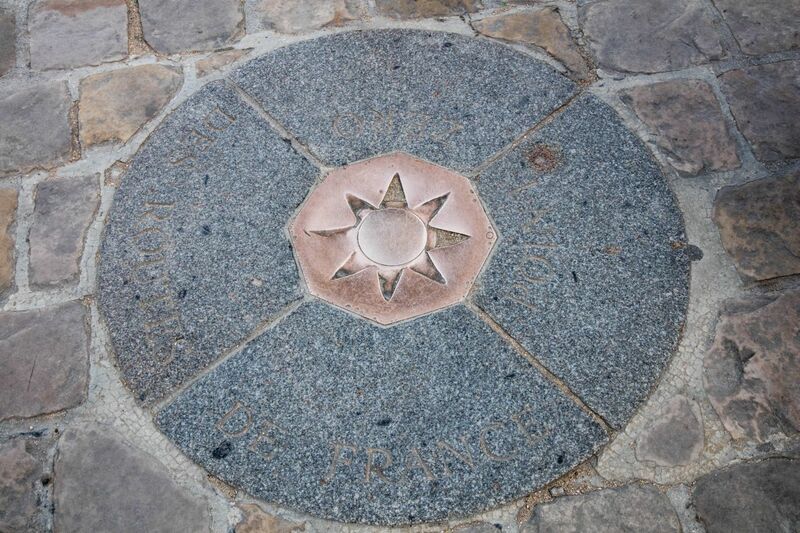 This is Point Zero, the geographic center of France, all distances in the country are measured from this point. The Louvre, you won’t see it all in a day, don’t even try. Make a plan and stick to it, then get out; save some for another day! 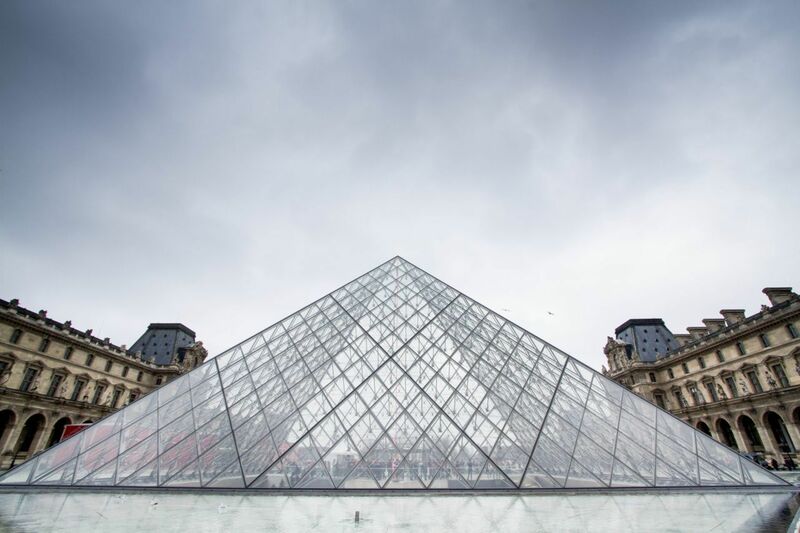 With over 35,000 pieces of art in more than 300 rooms, the world-famous Louvre museum will keep you busy every day for four months if you’ll let it. Going the first time, you can easily be overwhelmed. It’s a beautiful palace building, but can be confusing so it’s a good idea to plan what you want to see before you get there. Some of the more famous objects d’art are the Mona Lisa, the Venus de Milo, the Winged Victory of Samothrace, and the iconic painting of Liberty Leading the People. There are many popular exhibition rooms as well, such as the Egyptian Rooms and the Dutch and Flemish Painters. The official website is pretty well done and one of its features along with buying your tickets ahead of time (don’t forget! ), is they have developed 28 themed trails for you to follow your particular interests. The artists of Montmartre are the most camera shy, but they are talented! Montmartre is probably the most famous neighborhood in Paris. 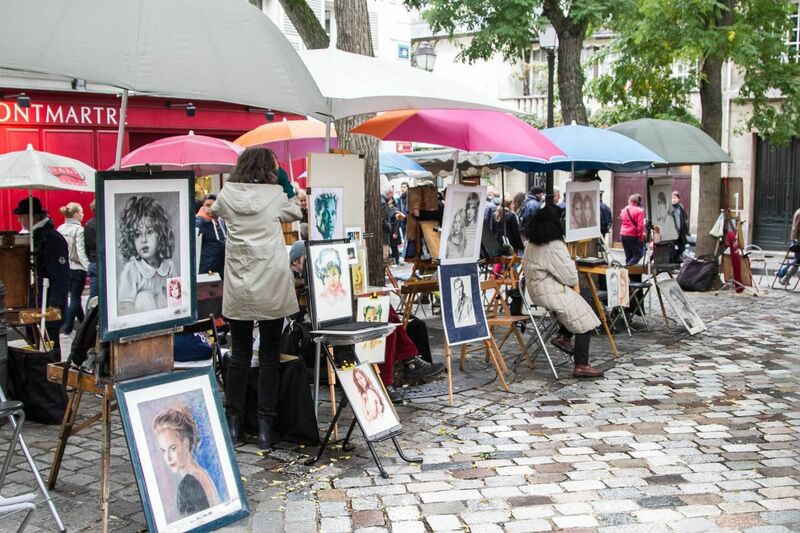 Everyone has seen photos of the artists in the Place du Tertre who are trying to make a Euro or two. This tradition harkens back to a time when famous artists like Picasso lived and worked in the area. If you want a watercolor or a portrait done, this is the place to go. I find the artists to be a bit surly and many don’t like you to take photos, so consider yourself warned. 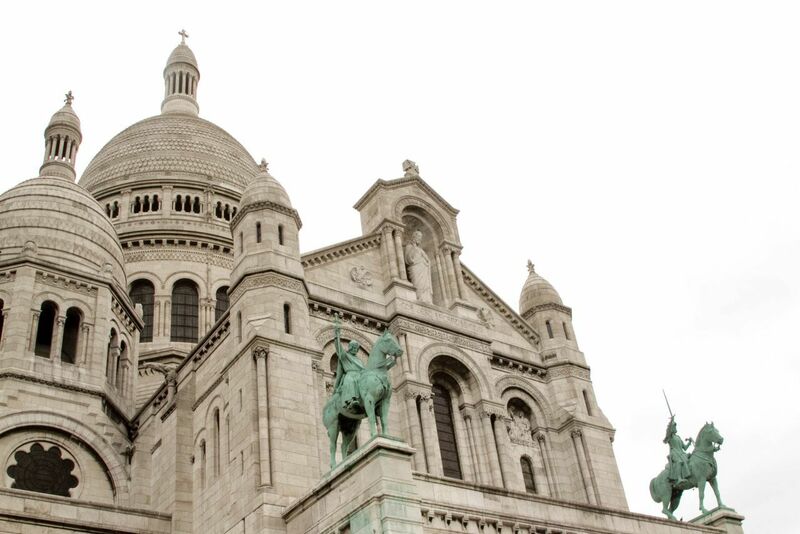 Along with the most famous site, Sacré-Coeur, there are plenty of other churches, shops, and cafés to help you while away your time. It’s easy to spend an entire afternoon wandering around this picturesque quarter. Don’t forget that sitting at a table in Paris costs you a little more than standing. If you want to read a book, work on your computer (plenty of free wi-fi around) that’s fine, but there will be a charge. Walk to the funicular and go for a ride, who put the fun in funicular? Paris! Built a little over a century ago, the Basilica of Sacré-Coeur shines throughout Paris with its white marble on one of the highest peaks in the city. Take note of its special features which include the apse mosaic, the grand organ, and the crypt. You can also easily attend services here, just check the official website for times. Not only is the entry free, but they will let you have an audio guide for free as well so you can get the most from your visit. Paris grew up around the Seine River and as a tourist you will find so much in the area to do. You can experience the magic of the Seine in a number of ways: walk, rent a bike, take a Seine cruise, take the Batobus (same as hop on and off, but on the water), have a picnic, bring your champagne and have a toast, or just canoodle with a lover on one of the banks. A trip to Paris without spending time along the Seine is an opportunity you will not want to miss. It’s magical. 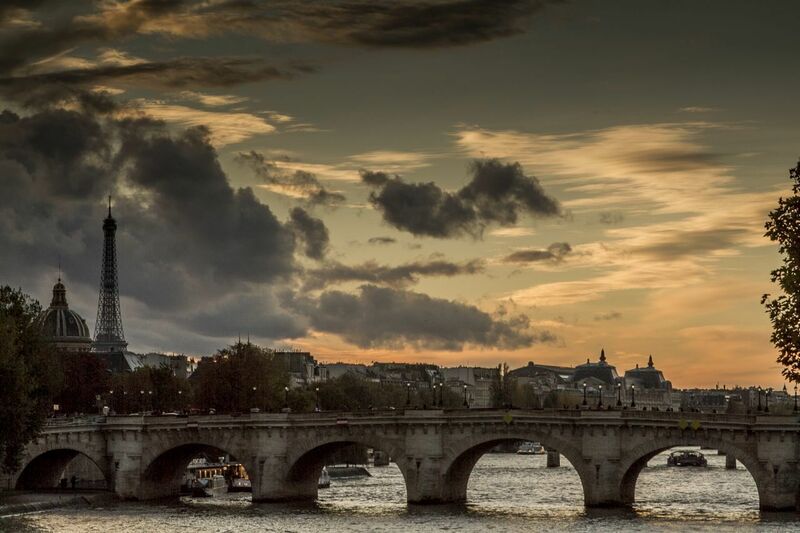 Going at sunset and standing on one of the many bridges from the Pont Neuf to the Pont des Arts, you will be enchanted and that is when you will know that Paris is the city for you. Best place to watch the river go by: Île de la Cité at the very tip of the island behind the statue of HenryIV – Bus24, 27 (Pont Neuf – Quai des Orfevres). 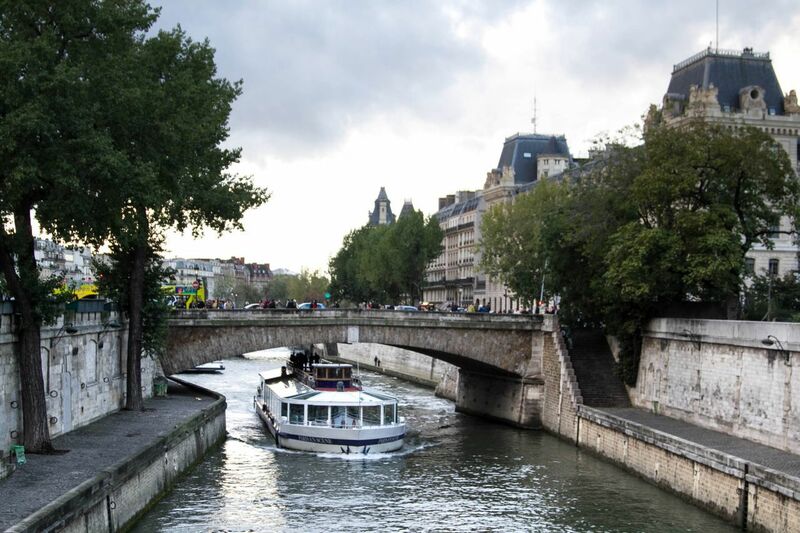 To catch a ride on a boat: Watch for a deal with your hotel we received a free boat tour on Bateaux Parissiens with our booking. Another good option is Batobus the hop on hop off boat, (less then 20 euro for a 1 or 2 day pass). Both options are at the river in front of the Eiffel Tower, just walk down the stairs after your tower visit. Everyone is mad about Macarons right now, and Laduree is the epicenter of the insanity! The most famous street in Paris is the Champs-Elysées! 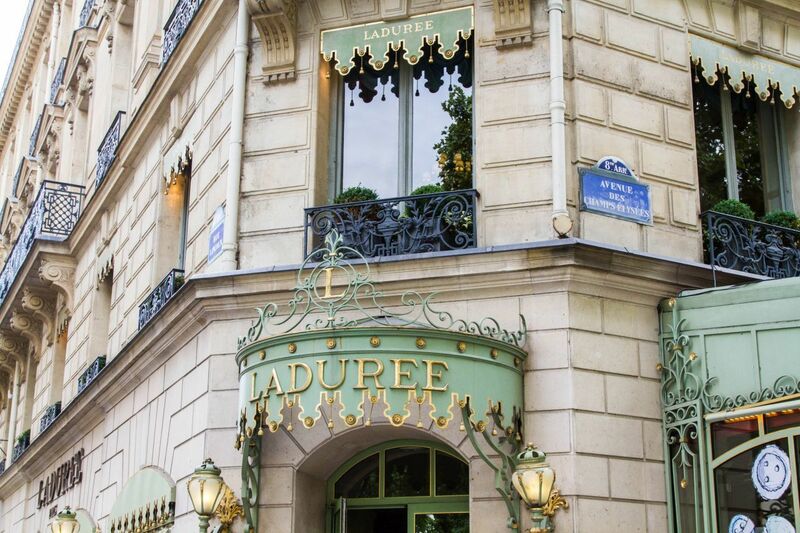 Whether you want to shop at the most fashionable stores such as Louis Vuitton or grab some delectable macarons at Ladurée or just have a nice dinner, don’t miss this iconic street. You don’t need to bring your credit cards to window shop, but you just might find something you can resist! It’s always a good idea to dress like a European and not stand out like a tourist. The cheese! Oh how I love the cheese of France. Buy a 100 gram slice and a baguette, et voila! Lunch! Every day of the week you can find a market in Paris. 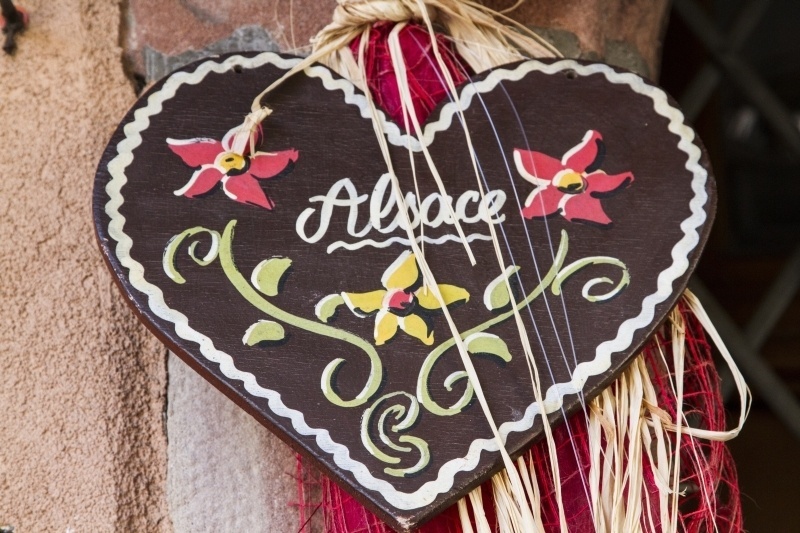 From trinkets to organic foods, from second-hand clothes to high-end antiques, there’s nothing more fun than finding a market and doing a little shopping. Of course, every market has some fantastic food stalls as well, where you can buy a cheap, but tasty lunch. Check here for a market that will work for you. 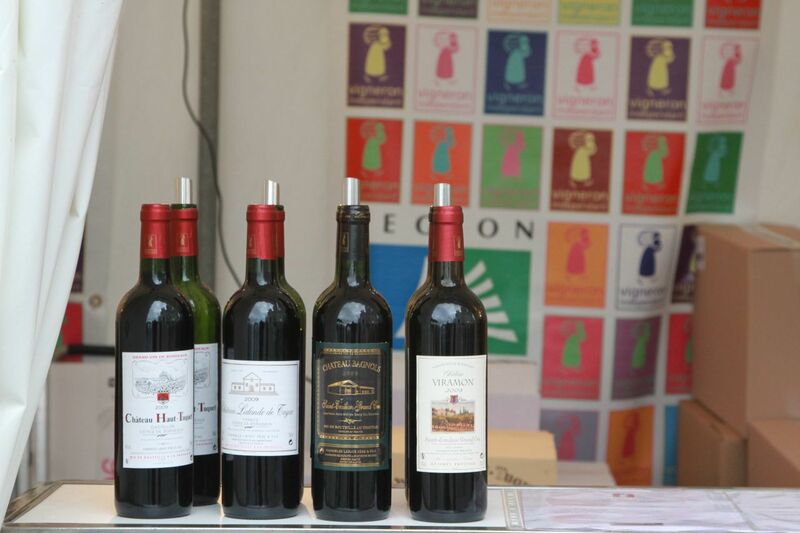 Most wine shops or market stalls will offer tastings, just be careful not to overdo it! While in Paris, it would be a shame not to indulge in all that she has to offer, and one of the best things of France is her food and wine. 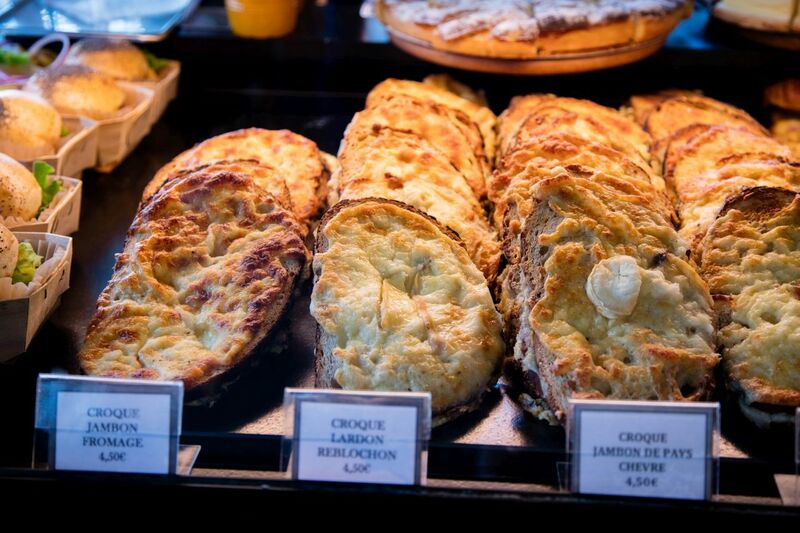 From a street-side Croque Monsieur to sampling wines from every region of the country, Paris is a foodie’s paradise. Some of our favorites include: soufflés, foie gras, and of course éclairs! There is so much to experience while you are in Paris, but if you start with these sights you can count on being content. 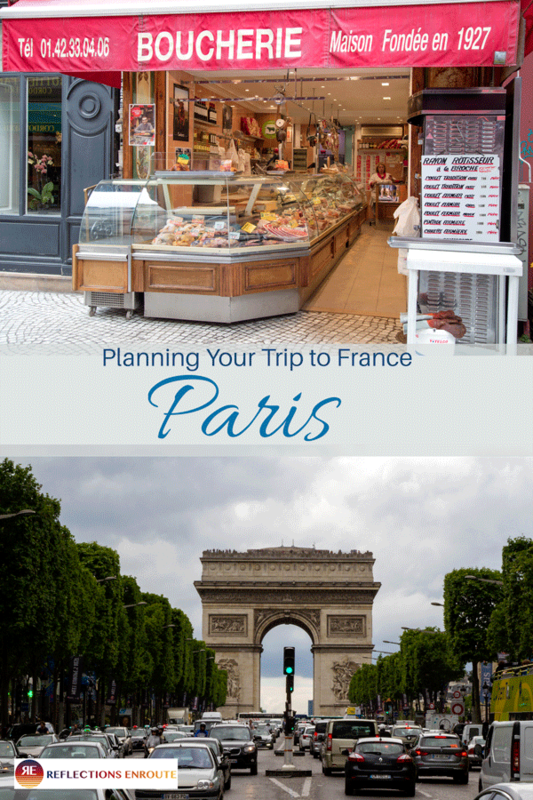 I do want to remind you that a country is not just its capital city, and there is so much more to do in France by starting with a few day trips! Paris is a big city with little or no parking. Leave your car at the hotel and use public transportation. Be prepared to walk, and walk, and walk. Did I mention Paris is a big city? No data? Plan and start you’re route while in Wifi then go for it! I prefer buses over metros when the traffic isn’t bad (ie rush hour) as their are no stairs to climb and much less walking between transfers. Bus, metro, tram ticket options buy a single ticket (1.80 euro), or a book of ten tickets (book of 10 is 14.10 euro). Each ticket is valid for 90 minutes of travel and must be stamped at the beginning of use. Taking more than 8 trips in a day? Consider a 1 day pass (12.30 euro). There is good food everywhere, but use Trip Advisor or Yelp to help you decide. Pin “The Most Popular Places in Paris” for later! 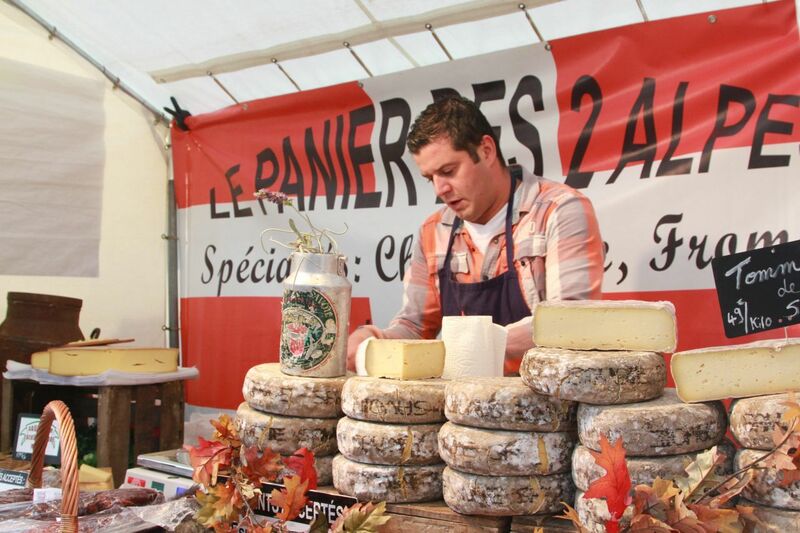 The Real Roquefort…Cheese that is! Beautiful photos of my most favorite city in the world. Beautiful photos! I’ve been 3 times and it’s never enough! But I love all of France – at least, what I’ve seen. I will never pass up a trip to France! And it. was my first place I went abroad when I was old enough to go also. Jill, Me too. I took French in high school and couldn’t wait to use it. That first trip brings back memories! I actually thought we didn’t do much in Paris, but we did all but one of these, and that’s only because the queue at the Louvre was way too long. Rhonda, That line is always too long. Next time order your tickets online. 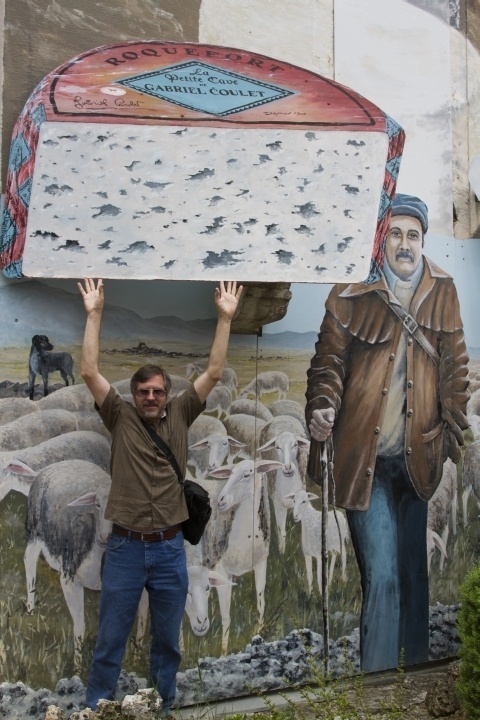 What Would The World Do Without Tourists?